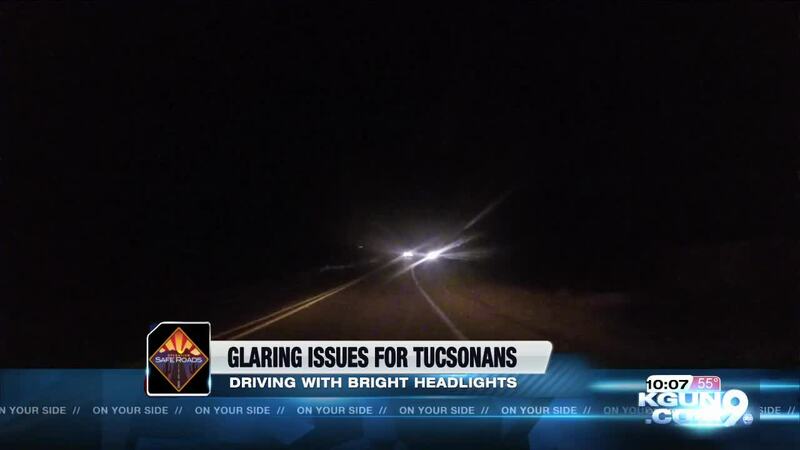 With different types of headlights on the road and different brightness levels, some Tucson motorists say it can cause a driving hazard. It's an issue you might not think about until you're driving at night. But for an instant, a bright flash from oncoming traffic headlights can, at the very least, be bothersome. Patricia Manspeaker, a Tucson Driver tells us, "I think it's both bothersome and dangerous. I think it's dangerous when you're going head on to people and I think it's dangerous in the rear view mirror. Blue lights and some have different shapes, motorcycles, that's a little frightening." Patricia is one of several people who have reached out to KGUN 9 to say that different kinds of headlights and colors make it harder to see while driving. The National Highway Safety Administration, or NHTSA says that they've received thousands of similar complaints regarding bright headlights, even though there is a legal minimum and maximum brightness that auto makers must abide by, Manspeaker feels that the standards might be worth re-evaluating. Many Tucson roads remain dark because of light pollution regulations for Kitt Peak and the many other observatories in the area. Jeff Asman feels that Tucson roads have particularly poor visibility because the roads are winding saying, "Yeah, sometimes you're just blinded and you pretty much just have to slow down, sometimes dramatically, because you can't see where you're going. If you need to, even stop if you're totally blinded, because you can't keep going. It's dangerous." AAA says over 50% of car accidents happen at night. Although bright headlights can't be blamed for all of them, being aware of the possible dangers and moving to the side if necessary, could prevent a future accident. Are your headlights bright enough?